“Carbon dioxide (CO2) and water vapor (H2O) are the only greenhouse gases that are likely to be present on Mars in sufficient abundance to provide any significant greenhouse warming,” said Jakosky, a CU Boulder professor of geology and lead author of the study appearing in Nature Astronomy July 30. 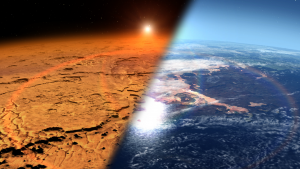 Although studies investigating the possibility of terraforming Mars have been made before, the new result takes advantage of about 20 years of additional spacecraft observations of Mars. “These data have provided substantial new information on the history of easily vaporized (volatile) materials like CO2 and H2O on the planet, the abundance of volatiles locked up on and below the surface, and the loss of gas from the atmosphere to space,” said co-author Christopher Edwards of Northern Arizona University, Flagstaff, Arizona. The researchers analyzed the abundance of carbon-bearing minerals and the occurrence of CO2 in polar ice using data from NASA’s Mars Reconnaissance Orbiter and Mars Odyssey spacecraft, and used data on the loss of the Martian atmosphere to space by the LASP-led MAVEN (Mars Atmosphere and Volatile Evolution) spacecraft. Another source is CO2 attached to dust particles in Martian soil, which could be heated to release the gas. The researchers estimate that heating the soil could provide up to 4 percent of the needed pressure. A third source is carbon locked in mineral deposits. Using the recent NASA spacecraft observations of mineral deposits, the team estimates the most plausible amount will yield less than 5 percent of the required pressure, depending on how extensive deposits buried close to the surface may be. Just using the deposits near the surface would require extensive strip mining, and going after all the CO2 attached to dust particles would require strip mining the entire planet to a depth of around 100 yards. Even CO2 trapped in water-ice molecule structures, should such “clathrates” exist on Mars, would likely contribute less than 5 percent of the required pressure, according to the team. Although the surface of Mars is inhospitable to known forms of life today, features that resemble dry riverbeds and mineral deposits that only form in the presence of liquid water provide evidence that, in the distant past, the Martian climate supported liquid water at the surface. But solar radiation and solar wind can remove both water vapor and CO2 from the Martian atmosphere. Both MAVEN and the European Space Agency’s Mars Express missions indicate that the majority of Mars’ ancient, potentially habitable atmosphere has been lost to space, stripped away by solar wind and radiation. Of course, once this happens, that water and CO2 are gone forever. Even if this loss were prevented somehow, allowing the atmosphere to build up slowly from outgassing by geologic activity, current outgassing is extremely low; it would take about 10 million years just to double Mars’ current atmosphere, according to the team. Read the original news feature from NASA.